A before and after view of a building that caught fire in downtown Grand Forks during the 1997 Red River flood. The Red River of the North has flooded repeatedly through the centuries. It is highly prone to spring flooding because of its northward flow, the nearly flat former lake bed of the valley, and ice formation on the river. As spring approaches, the snow melts from south to north in the same direction as the riverflow. At times high waters encounter ice on the river and back up, spreading out of the banks. The wide flatness of the terrain, formed from an ancient lake bed, and the low slope of the river also contribute to severe flooding in the region. Serious floods occurred in 1948 and 1950. The 1950 flood reached a high of 30 ft (9.2 m) at Winnipeg and caused the largest evacuation in Canada's history: an estimated 70,000 to 100,000 people had to be evacuated. An estimated $606 million CAD (1997) of damage resulted. In the aftermath, the government of Manitoba and the Canadian federal government constructed flood safety measures. The first known records of floods along the Red River were documented in the 1770s. Severe floods have occurred throughout the 19th and 20th centuries, including in 1979. Residents and officials incorrectly assumed that homes that were safe in 1979 would be beyond the reach of a future flood. The Red River forms the border between Minnesota and North Dakota. A few sets of "sister cities" developed along opposite sides of the river. Grand Forks, North Dakota and its counterpart East Grand Forks, Minnesota, were the pair most severely affected by the 1997 flood. Fargo, North Dakota/Moorhead, Minnesota (Fargo-Moorhead) and Wahpeton, North Dakota/Breckenridge, Minnesota also had severe flooding. Much of the flooding accumulated not only because of the rising river levels, but also from overland flooding, as meltwater did not drain away. Temporary dikes were erected along the riverfront and around the edges of towns, but were sometimes overwhelmed. It was difficult for the cities to prepare for such an enormous flood. The National Weather Service (NWS) had forecast that the river would crest at 49 feet (14.9 m), which was its highest level during the 1979 flood. The cities had built dikes to this level, but the river continued to rise past it. Taken by surprise, the NWS did not upgrade its forecast until April 16, the day the river reached 49 feet. The dikes in the low-lying Lincoln Drive neighborhood of Grand Forks were the first to break, doing so early on April 18, as the river kept rising. Other dikes in the Grand Forks and East Grand Forks area failed that day and the next, flooding thousands of homes. During this time, Grand Forks mayor Pat Owens ordered the evacuation of more than 50,000 people, much of the population of the city. This was the largest evacuation in the United States since the evacuation of residents in Atlanta, Georgia during the Civil War. Water reached areas more than two miles (3 km) inland from the Red River, requiring evacuation of all of East Grand Forks and 75% of Grand Forks. School was cancelled in both cities for the remainder of the term, as were classes at the University of North Dakota. All transportation was cut off between the two cities (and for many miles, the two states). East Grand Forks residents were evacuated to nearby Crookston, namely to the University of Minnesota Crookston. Residents of Grand Forks were given mandatory evacuation orders on April 18, and retreated to Grand Forks Air Force Base (residents stayed in airplane hangars, which were supplied with more than 3,000 cots). Many residents also evacuated to motels and homes in outlying communities. The river crested at 54.35 feet (16.6 m) on April 21, and the river level did not fall below 49 feet (14.9 m) until April 26. Because water drained so slowly out of the most low-lying areas, some homeowners could not visit their damaged properties until May. By May 30, the Red River had receded below flood stages everywhere in North Dakota. 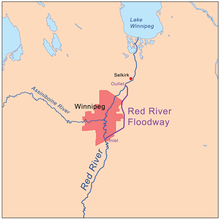 The province of Manitoba completed the Red River Floodway in 1968 after six years of construction, built permanent dikes in eight towns south of Winnipeg, and built clay dikes and diversion dams in the Winnipeg area. Other flood control structures completed later were the Portage Diversion and the Shellmouth Dam on the Assiniboine River. Even with these flood protection measures, in 1997 the province had a flood cresting at 21.6 ft (6.6 m). It caused 28,000 people to be evacuated and $500 million CAD in damage to property and infrastructure. The 1997 flood was a 100-year flood. It came close to overwhelming Winnipeg's existing flood protection system. 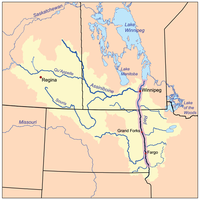 At the time, the Winnipeg Floodway was designed to protect against a flow of 60,000 cu ft/s (1,700 m3/s), but the 1997 flow was 63,000 cu ft/s (1,800 m3/s). To compensate, the province broke operational rules for the Floodway, as defined in legislation, during the night of April 30 / May 1, to prevent waters in Winnipeg from rising above the designed limit of 24.5 ft (7.5 m) above the "James Avenue datum", but causing additional flooding upriver. The mayor of Winnipeg, announcing that the design limit had been reached, misinterpreted this as good news that the flooding had peaked. City sand-bagging stopped, and national reporters left the city, but the water continued to rise inside and outside of the city until the peak late on May 3 / early on May 4. The city officials have said that the peak occurred on May 1; scientific reports record a peak on May 3/4. Towns upriver of Winnipeg, forewarned by footage of buildings in Grand Forks burning and covered in meters of water, built ring dikes to protect their homes and properties. The province of Manitoba called in the Canadian Forces, the Royal Canadian Mounted Police, and the provincial Department of Natural Resources. Many people chose to evacuate, including residents from Morris, who had only two days notice to evacuate to Winnipeg. Thousands of volunteers helped to build sandbag dikes around homes and property. An emergency 42 km (26 mi) long dike, later called the Brunkild Z-dike, was constructed in a matter of days when officials realized that overland flooding threatened the city of Winnipeg. It cost $10 million (CAD). Almost all of the ring dikes around the towns held, except for that at Ste. Agathe. The town's dike system was prepared for the river approaching from the south, but the river had spread widely and floodwaters swamped the town from the west. At the flood's peak in Canada on May 4, the Red River occupied an area of 1,840 km2 (710 mi2) with more than 2,560 km2 (990 mi2) of land underwater, which earned it the nickname "Red Sea." While the flooding was still underway, the federal Liberal government led by Jean Chrétien called a snap election. Several of the party's MPs from the province, including Reg Alcock, requested a delay until the flooding was under control. When Chrétien let the election go ahead as originally planned, Alcock transformed his campaign office into a volunteer relief centre, spending his time in relief efforts instead of campaigning, and won re-election. In July, Canadian Prime Minister Jean Chrétien and United States President Bill Clinton appointed the International Red River Basin Task Force, comprising members from both countries. The task force's purpose was to find ways to improve flood forecasting. The province of Manitoba asked the International Joint Commission (IJC) to provide a report on the flood event and to recommend measures to ensure further flood protection for the city of Winnipeg. Largely as a result of this study, the province widened the floodway between 2004 and 2010. Catastroffiti, a form of graffiti related to natural disasters, starts to appear as affected residents gut their houses, placing damaged materials on the berms. At first, this graffiti was placed on trashed appliances to prevent theft and resale, but soon expanded in medium and purpose. The graffiti done mostly in spray paint (also mud) started to not only be a precaution, but a dialogue of emotions related to the effects of the flood. Post-flood emotions driving this largely consisted of frustration with the National Weather Service after it predicted a flood crest about five feet less than the actual. As this developed, catastroffiti was appearing on not just household appliances, but also houses, garages, and signs. In the aftermath of the 1997 Red River Flood, catastroffiti became a method of commentary and coping in the affected areas. ^ "A city submerged: Winnipeg and the flood of 1950". CBC. Retrieved September 17, 2007. ^ "A History of Flooding in the Red River Basin" (PDF). USGS. Retrieved October 3, 2007. ^ a b "Flood of criticism from 1997 floods: Did faulty forecasts add to disaster?". USA Today. November 10, 1999. Retrieved November 3, 2007. ^ "Record floods along the Red River in 1997". USA Today. November 10, 1999. Retrieved November 3, 2007. ^ Shelby, Ashley (2003). Red River Rising. United States: Borealis Books. p. 102. ISBN 0-87351-500-5. ^ "Great Flood of '97". University of North Dakota. Archived from the original on March 11, 2008. Retrieved November 3, 2007. ^ "Grand Forks 1997 Flood Recovery: Facts and Statistics". FEMA. Archived from the original on March 28, 2009. Retrieved October 1, 2007. ^ Douglas C. Friez; Kathleen Donahue (March 1998). "North Dakota After Action Report – Historical Perspective". North Dakota Emergency Management. Archived from the original on February 22, 2001. Retrieved October 4, 2007. ^ a b Hutton, David (November 1, 2004). "Psychosocial effects of a natural disaster: a post-flood assessment in the Red River Valley". Environments. Archived from the original on March 27, 2009. Retrieved November 3, 2007. ^ a b c d Etkin, David; Chowdhury Emdadul Haque; Gregory Robert Brooks (2003). An Assessment of Natural Hazards and Disasters in Canada. London: Springer. p. 349. ISBN 1-4020-1179-2. ^ a b Fong, Petti (May 5, 2007). "Bracing for the next 'flood of the century'". The Star. Toronto. Retrieved November 3, 2007. ^ "Artificial Crest to keep Red high well into June". Winnipeg Free Press. May 4, 1997. p. 2. ^ "Flood of the Century: Chronology of Flood Events – 1997". City of Winnipeg. Retrieved January 13, 2017. ^ "Flood of the Century: What does James mean?". City of Winnipeg. Retrieved February 27, 2017. ^ "Diking Commissioner's Reports". Archived from the original on May 7, 2011. Retrieved May 13, 2011. ^ "1997's 'Z-dike' showcased province's flood-fighting machine". CBC News. April 25, 2007. ^ Lett, Dan (April 15, 1997). "MPs want vote delayed". Winnipeg Free Press. ^ Robertson, Bud (April 29, 1997). "Politicians unite against flood". Winnipeg Free Press. ^ Harper, Tim (April 29, 1997). "McDonough says election call 'insensitive'". Toronto Star. ^ a b c d e f Hagen, Carol A.; Ender, Morten G.; Tiemann, Kathleen A.; Hagen, Jr., Clifford O. (1999). "Graffiti on the Great Plains: A Social Reaction to the Red River Valley Flood of 1997". Applied Behavioral Science Review. Elsevier Science Inc. 7 (2): 145–158. ISSN 1068-8595. ^ Pielke, Jr., Roger A. (1999). "Who Decides? Forecasts and Responsibilities in the 1997 Red River Flood". Applied Behavioral Science Review. 7 (2): 83–101. Jacobs, Mike, Ed. (August 1997). Come Hell & High Water. Grand Forks, North Dakota: Grand Forks Herald. ISBN 0-9642860-2-5. Galloway, Gerald E.; Clamen, Murray (2000). Living with the Red: A Report to the Governments of Canada & the U.S. on Reducing Flood Impacts in the Red River Basin. Diane Publishing. ISBN 0-7567-0802-8. Shelby, Ashley (April 2004). Red River Rising: The Anatomy of a Flood and the Survival of an American City. St. Paul, Minnesota: Borealis Books. ISBN 0-87351-500-5. "Red Cross Is Accused Of Misusing Flood Relief". Retrieved January 1, 2016. 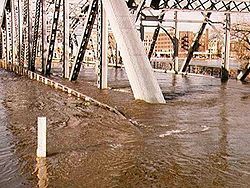 Wikimedia Commons has media related to 1997 Red River Flood. "Red River Rising: Manitoba Floods". CBC. Retrieved May 9, 2006. Draves, Alan (2002). "The 1997 Flood in Grand Forks North Dakota". Archived from the original on May 8, 2006. Retrieved May 9, 2006. "Photographs of Flooding In the Fargo-Moorhead Region: 1997". Geology of the Fargo-Moorhead Region. North Dakota State University. Archived from the original on April 26, 2006. Retrieved May 9, 2006. "Canadian Government Satellite Photo". Archived from the original on August 21, 2008. Retrieved August 21, 2008. This page was last edited on 22 February 2019, at 10:26 (UTC).